Found 33 file extension associations related to SoftMaker Office and 1 file format developed specifically for use with SoftMaker Office. 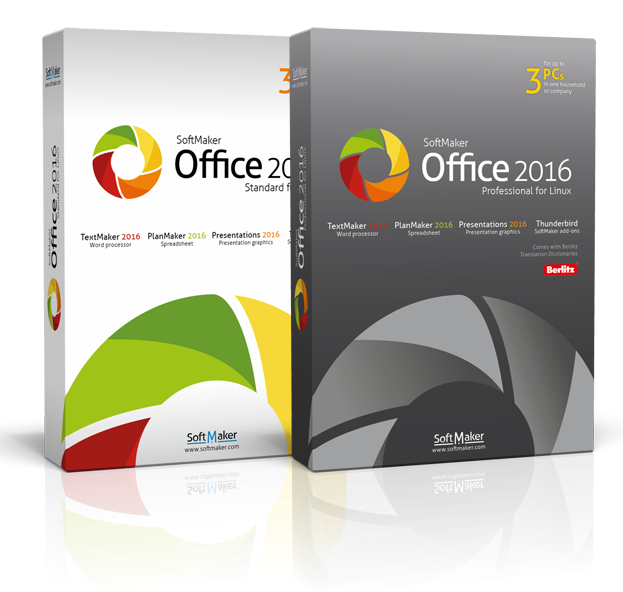 Choose SoftMaker Office as your office suite, and you will get the job done in less time and with better results. SoftMaker Office reads and writes Microsoft Word, Excel, and PowerPoint files seamlessly – and costs only a fraction of Microsoft Office. Powerful: Sophisticated office software for business and home users alike. Compatible: Reads and writes all Microsoft Word, Excel, and PowerPoint files seamlessly. Fast: Starts and works blazingly fast. Slow is out. Reliable: Does what you want. No nasty surprises. TextMaker, the reliable and friendly word processor that reads and writes Microsoft Word files without a hitch. PlanMaker, the fully Excel-compatible spreadsheet that lets you create the most elaborate worksheets. SoftMaker Presentations, the presentation graphics program that simply creates better-looking presentations than Microsoft PowerPoint. BasicMaker, a scripting language and environment that lets you automate recurring tasks. All programs are a perfect match. They not only provide consistent menu and dialog box arrangements, but can also exchange data smoothly with each other. If you need more information please contact the developers of SoftMaker Office (SoftMaker Software GmbH), or check out their product website.